Hi there, I have an issue when opening Netflix with Electron. I had a Widevine plugin working for some time, and it started to fail unexpectedly. Could you help troubleshoot this please? When widevine plugin is correctly loaded, it should play Netflix. 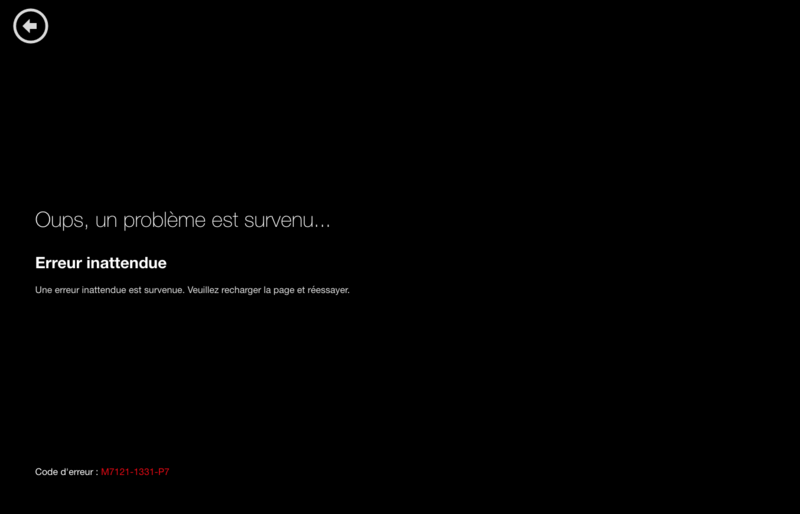 Getting an error in Netflix, eventhough shaka and bitmovin show a correctly loaded and activated widevine plugin. I've created a very simple repo which will help reproduce the issue easily. You'll be able to also load Bitmovin and Shaka to ensure Widevine is indeed correctly enabled. 👋 Thanks for opening your first issue here! If you're reporting a 🐞 bug, please make sure you include steps to reproduce it. We get a lot of issues on this repo, so please be patient and we will get back to you as soon as we can. Because we treat our issues list as the team's backlog, we close issues that are questions since they don't represent a task needing to be completed. For most questions about Electron there are a lot of options. Check out the Electron community. There are also a bunch of helpful people in this community forum that should be willing to point you in the right direction. @sofianguy It might have been formuled as a question, but I do think it's a bug on Electron's part, or a bad documentation. And I did everything needed to describe it as well as I could, with repro steps and all. Even though this issue has been closed, I've new informations for any new person that will come here for answers, because this is an Electron issue nonetheless. It appears that Netflix implemented a new VMP (verified media path) support to the Widevine browser CDM lately. So the little players/browsers won't be able to play DRM content without a proper, whitelisted, Widevine CDM installation coming from Google. Brave got the same issue, Vivaldi as well. I've contacted them to see what are the steps to get a legit widevine plugin. Also, I've created a bountied question on StackOverflow. Basically, it means that Electron based apps won't be able to play Netflix anymore. @levrik I confirm, there is no solution as of now. I'm still waiting after Google to get a widevine legit plugin. But I'm not really confident. In the mean time, I'm working on a shady solution. We'll see where that takes me. If you get it to work, I'm really interested, because I have a desktop app, published on the AppStore that isn't working with Netflix anymore. @yoannmoinet What is the app you have published? It gets it's Widevine binaries from this URL https://redirector.gvt1.com/edgedl/widevine-cdm/1010-win-x64.zip which seems to be Google owned according to whois entry. Thank you @levrik, I've tried your link. Unfortunately it's missing the adapter needed by Electron. I might try using the Brave's engine Muon that is a fork of Electron, they have a different way to register the widevine plugins. @yoannmoinet The adapter is inside the GitHub releases of the linked repo. Also wanted to try out Muon. Will do so tomorrow after work. oh man... it's working when using the electron-releases package. Thank you so much @levrik. Unfortunately it won't build with it. At least, I'm able to make Netflix work in development. It lets me have a new way to investigate the issue. @yoannmoinet Do you plan to write an message to that mail address from the LICENSE.txt? If yes, would be interested in the outcome. I might, I've already contacted Google on another email address (widevine-support@google.com) to get a legit plugin. I'll try again on this one. @yoannmoinet Nice, please keep me posted. Also via mail if you don't want to post that in public (see my GitHub profile for that). @yoannmoinet any updates on this? I have contacted widevine myself and have yet to hear back. @ccj242 unfortunately still nothing from Google (widevine). I'll keep you posted here once I have something new. Looking at the castlabs/electron-releases repo, it seems several have been able to build using it and the certificates they received from Google; does this mean that the Widevine plugin is no longer viable in versions of electron >v1.7.x? (as VMP was introduced in Chrome 59, which was introduced in v1.8.0). From the maintainer of castlabs/electron-releases, "regular Electron does not provide Widevine support without manually installing a Widevine CDM, which makes just signing it pointless. Even with a manual CDM installation there are other aspects of VMP that need to be fulfilled that stock Electron does not, this is part of the value the castLabs Electron releases bring to the table. ", so there should probably be something in the docs mentioning that. >= v1.8.x: One needs to include the Widevine plugin AND Verified Media Path (VMP) application signing, which can be done more easily with castlabs/electron-releases, which handles the plugin for you and supplies a script to sign the application, but VMP requires getting a certificate, passphrase, and key from Google, which can be requested at widevine@google.com, but it WILL take time to get it back (weeks to months). Additionally, the castLabs version will always be behind the electron version and does not support Linux. Also, one cannot simply take their signing script and use it on the normal version of electron as they have done special work to electron to make it compatible with VMP-signing. @yoannmoinet Did they get back to you? To share my experience, my non-profit sent 3 certified letters to widevine headquarters in addition to countless online forms and emails sent and have received no word whatsoever. Very frustrating. I'm beginning to worry this is a lost cause. Has this been your experience too @yoannmoinet? My company uses DRMToday (paid-service owned by castLabs) and they were able to get us the necessary items, though it still took months. @alexanderturinske I've contacted widevine-support@google.com and they answered me 1.5 month later. They asked if I had completed the 'Widevine MLA'. I had no idea what it was, so I asked them. No news for more than 2 weeks now. I'll ping them again. I've passed the one year anniversary waiting for my license. Still no license, but I've finally signed an agreement a few weeks ago. Waiting for the next steps. Don't get your hopes up, I signed my agreement a few months ago and after repeated emails, still have no response.